Christopher will be the tenor soloist with the Colgate University Chorus under the direction of R. Ryan Endris. 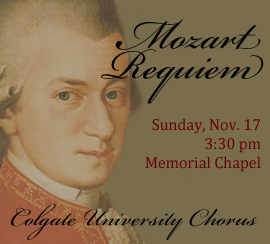 The performance will take place in Colgate University Memorial Chapel on November 17, 2013 at 3:30pm. The concert is free to the public.